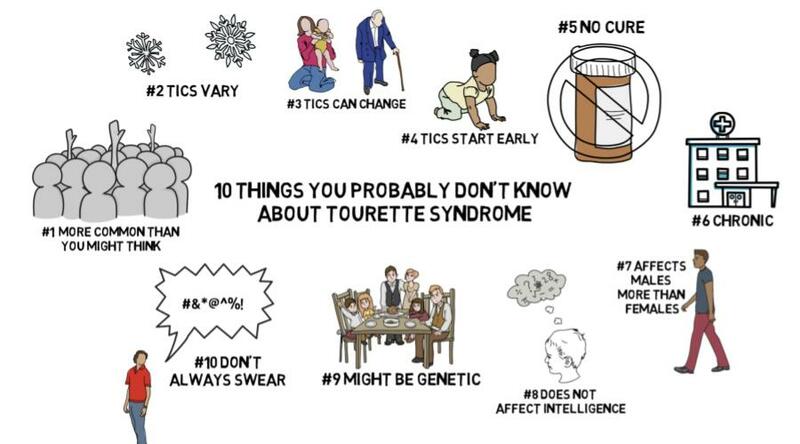 Here are 10 facts about Tourette Syndrome that you probably didn’t know. Tourette Syndrome is more common than you might think. 1% of children in America, have some form of Tourette Syndrome. So there is a significant chance that several people in your local elementary school, middle school, or high school struggle with Tourette’s. That statistic is the same for children with Autism, but we’re likely more aware of Autism because it’s signs and symptoms generally more consistent and noticeable than the small tics of Tourette Syndrome are. Ticks vary from person to person. People with Tourette Syndrome are like snowflakes–unique. Two people may have similar tics, but no two people will have the exact same combination of tics. Ticks can change throughout your lifetime. When you’re young, you may have completely different ticks than you’ll have 20 years down the road. Tics can also vary in severity. Tics generally start appearing at early stages of life. Usually, they start affecting children between the ages of 5 and 10. There is currently no cure for Tourette Syndrome. And unlike most illnesses, there is no treatment or drug that can alleviate the symptoms. Tourette Syndrome is chronic. That means that, although tics may change or start to disappear, the condition will likely be lifelong. Tourette Syndrome affects males more than females. Although both men and women struggle with Tourette’s, about 4 males are diagnosed for every female diagnosis. Tourette Syndrome does not affect a person’s intelligence. Unlike some conditions, where mental capacity is affected, people who struggle with Tourette Syndrome have no mental disadvantage. In fact, some children diagnosed with Tourette Syndrome have a higher than average IQ. Tourette Syndrome might be genetic. Research is still being done, but evidence from recent studies shows that it is likely Tourette Syndrome is an inherited disorder. Some researchers argue that combinations of genes and the environment a child grows up in can influence the presence of Tourette Syndrome. People with Tourette Syndrome don’t always swear. TV and media have popularized the idea that victims of Tourette Syndrome uncontrollably blurt out obscenities or curse words. However, most people struggling with Tourette’s have never, and will never, have that specific tic. Only 1 in 10 people with Tourette Syndrome do, and they have a special condition known as Coprolalia. *Click here to watch more videos about Tourette’s.